Travel with the North Kyushu UR Rail Pass (Cost: 8,500 yen), actual savings 11,280 yen. This will be my 7th time in Japan, but 3rd time in Japan this year. Finally I can visit Kyushu area! Hong Kong had a long weekend because of Mid-Autumn festival, so I flew in early on Friday morning so explore the area. Before my trip, I purchased the JR Rail pass for North Kyushu area. This will cover you most of Kyushu except for Kagoshima which is the most southern city of Kyushu. It costs 8,500 yen, but because I’ll be taking a 2hr limited express train to Nagasaki, and a non-stop Shinkansen to Kumamoto, I’m actually saving 11,280 yen by getting this pass in advance! Also with the rail pass, you can have reserved seats booked for you in advance! This JR Rail pass is only for people who hold non-Japanese passports. You can get it at most major travel agencies, purchase it on HK Express flights, or purchase it in major JR train stations within Japan. Other than that, for the most part of my trip I will be taking trams or the local buses. Google maps is pretty good with these routes, and the signs for time tables at the stations are easy to read, so it’s no hassle at all taking these instead of the subway (if there is one). I have a very unhealthy obsession with Japanese temples, whether it’s Shinto or Buddhist temples, I will visit as many as I can. I really love all the different styles they have! So before my trip I was also looking up the more famous temples in each of these cities. I accidentally found a temple (Miyajidake) in Fukuma (a city just 30 minutes north of Fukuoka) that has an amazing view with Toori doors leading to a long road overlooking the city from a hill. I’ll talk more about it later in this blog. Besides looking up temples, I also check the city calendar before I go to Japan, especially during the summer. There are many festivals held by local temples that have fun activities. In this case, I was in one of the big 3 festivals of Kyushu – Hojoya Festival. Literally translated, Hojoya means the day where you let animals back into the wild. Hakozaki shrine holds this festival and there are hundreds of stalls forming a night market along the long walk to the entrance of the shrine. 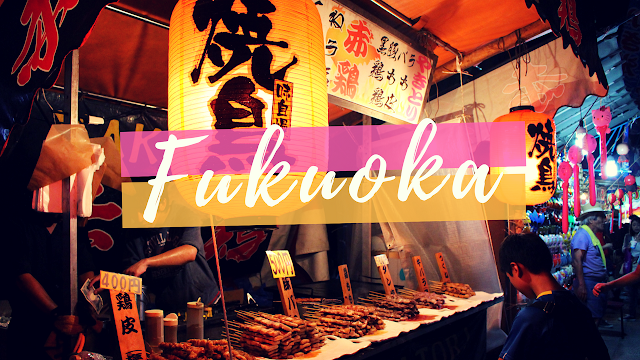 When booking the hotels for Fukuoka, I noticed there’s very few and they are all pretty pricey, starting around $1,000 HKD per night ($130 USD/night) for a small singles room. I guess because it’s the summer holiday season so it’s really expensive, even more expensive than Osaka and Tokyo! In those cities you get more options. I ended up staying at Benika Calton Hotel. It isn’t around any subway station, but it is actually along one of the most popular Bus routes from Hakata Main station! I could virtually take any bus from Hakata station for 5 minutes and get to my hotel. Or it is a 20 minutes’ walk to any major station (Hakata / Tenjin). Fukuoka isn’t that big of a city, so it can be easily done on foot. Another great thing about Fukuoka is that the Airport is only 2 subway stations from Fukuoka’s main JR/Shinkansen Station – Hakata Station. However if you are flying in International, you’ll need to take a free shuttle bus for 5 minutes to get to the Domestic terminal for the subway station. 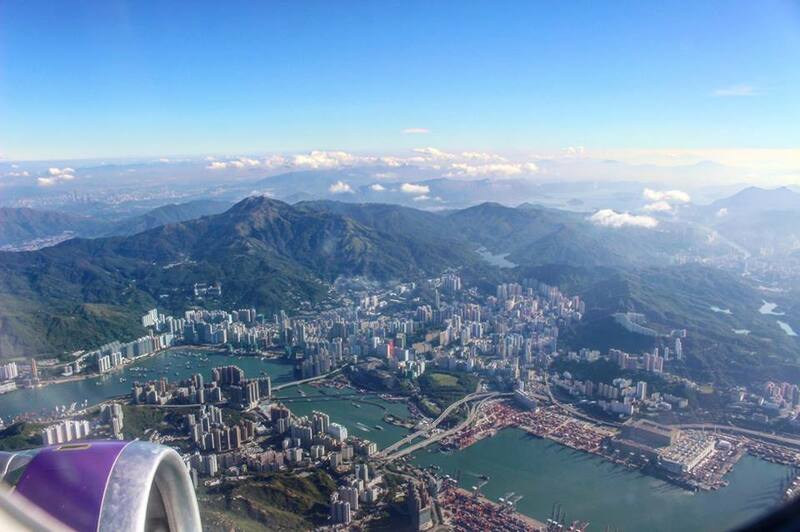 My flight took off around 8am, the sun was just rising above Hong Kong. I’m lucky this time where I sit on the side with the perfect view over Hong Kong, and it is just breathtaking! You don’t realize how beautiful the city looks until you see it from above. There are just towers of buildings surrounded by mountains all over and then the blue ocean. You don’t see any flat land at all, space is limited and the density is high. It’s a short 3 hour flight to Fukuoka, and although I woke up at 5:30am, I was too excited to nap and catch up on sleep. Flying just along the ring of fire of the Far East, we flew above Taiwan for a good 30 minutes. The skies were clear and I could see my hometown as we passed by. We descended into Fukuoka International airport around noon time, and this is the second shortest runway I have seen in my life (Boracay is #1). It’s one of those short runways where you run out of runway and have to U-turn back to the terminal and plans share the runway for take-off and landing. I learned at Fukuoka Airport International immigration that there were really rude Japanese people, too. My passport is expiring in less than a year, which means I got it around 9 years ago when I was still in High School. I haven’t done any plastic surgery but back then my hair was black and I had no makeup on. The lady, oblivious to the fact that I speak Japanese (a lot of Taiwanese do, well Japan colonized us for 50 years), started saying sh*t about my photo with her colleague. “Isn’t that too different? What is up with these people. This is not the same person”. I’m pretty sure she had a stern word from her boss the week after because I wrote a really direct “feedback letter” about “raising the standard of training for the attitude of their International Immigrations staff”. I hopped onto the bus for the domestic terminal, then went to the subway to get to Hakata main station. There, I picked up my JR Rail pass. I ordered my reserved seats for the trip on the last day to Kumamoto on the Shinkansen. Outside the main entrance of Hakata Station, I was looking for the bus to my hotel. It’s just 100 yen and I need to get to Yanagi-bashi. Almost all buses go there (#15, #16, #17, #58, #65, #88, #214, #302, #303, #305), so I didn’t even have to wait. I checked in and started exploring around in the city! 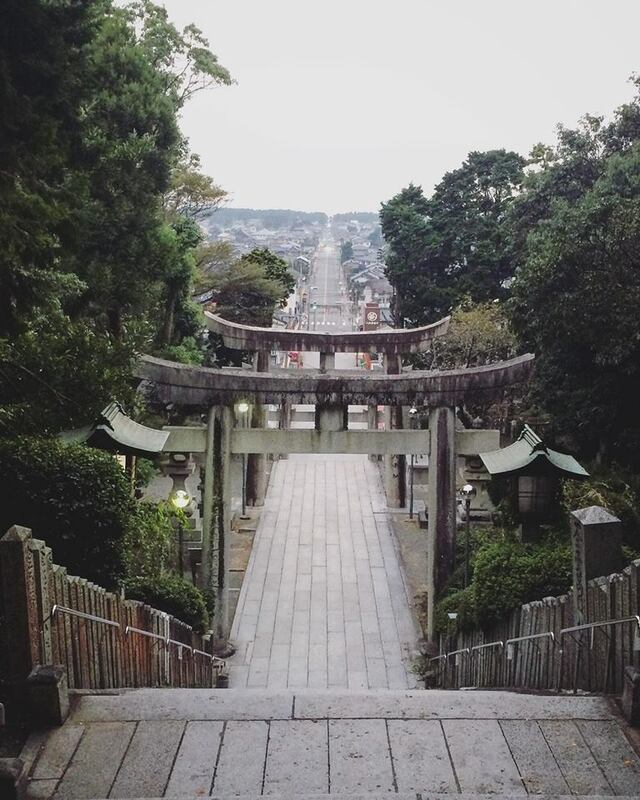 Next I walked a little further to Kushida shrine. 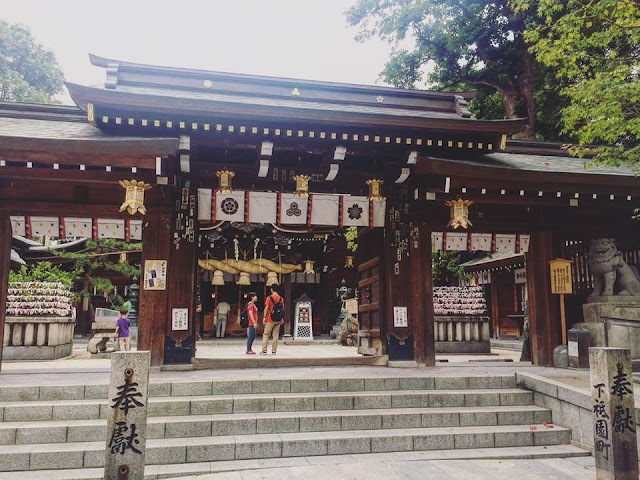 If you want to see Kyushu style temples and get a good feel of the culture here, you must go to this shrine. They are famous for these really tall colorful statues (about 1 – 1.5floor tall) full of dolls on it. I’m not really sure what they are called, but I definitely haven’t seen this in other regions in Japan yet. The shrine itself is also really pretty. It uses a lot of gold, brown, and black colors. I’m going to guess this shrine is related to samurais. In this shrine, they offer Omikuji in many languages, I believe they have English, Korea, Traditional Chinese and Simplified Chinese (maybe Thai?). There were a lot of foreign visitors in this shrine, so no wonder! Last stop before I head to the railway station is Tochoji Shrine. This is a Buddhist shrine with a red and white pagoda tower. The grounds were already closed so I couldn’t see much, so I only stayed for a little and headed for Hakata Station. I took the train north for 30 minutes to Fukuma Station. I don’t think a lot of people know about Miyajidake Shrine in Fukuma. However this temple was pretty famous on Pinterest as a representation of Fukuoka area. And it makes it near the top of the list of beautiful shrines I’ve seen in Japan. It is a 30 minute walk from Fukuma station, so I waited for bus #1-2 or bus #5. After getting off the bus, the shrine was towards the right hand side into the mountains. I walked through what looked like a Shotengai (shopping street) with old shops, but none of them were opened. A lot staircase through stone Toori gates lead up to the entrance of the shrine. At the very top of the steps is where you get the best view. The sun was just setting, and there was barely anyone, so it was perfect for a photo moment. The Shrine itself was really quiet but majestic with the mountains in the entire background. After sunset, I headed back to Fukuma station via the same bus #5 again. I took the train back to the station near Hakozaki Shrine. It’s holding the Hojoya Festival, one of the big 3 festivals in Kyushu region. It felt like the whole entire population of Kyushu was there! It was incredibly crowded. There were families with kids everywhere! Hojoya literally translated is a day you let animals back out to the wild. A very long road (probably for at least 2km? 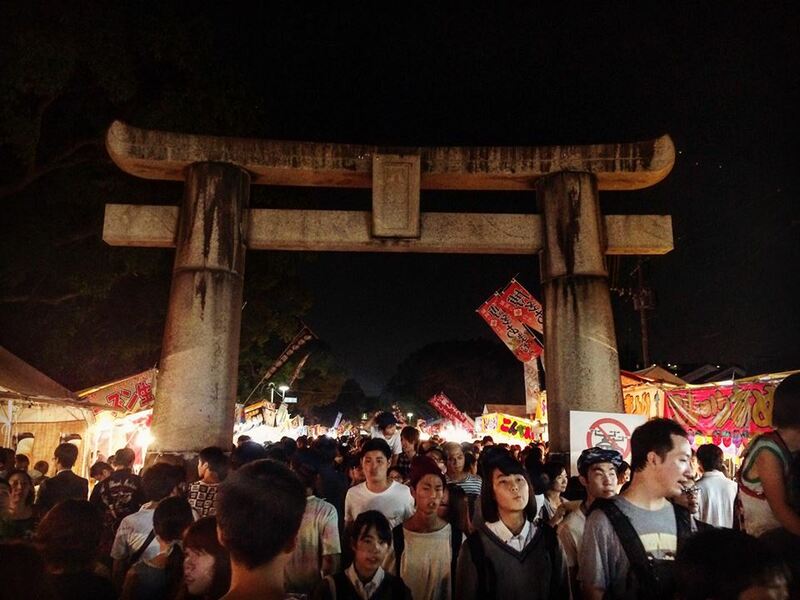 or I was just walking really slow so it seemed long) in front of Hakozaki shrine was full of vendors. They were selling anything from food, lucky draw games with toys, gold fish fishing (via a palm size a hoop with thin paper in the middle that dissolves into water), origami folding challenges, pet insects (very common and popular pet for Elementary school kids in Japan), just anything you can think of really! 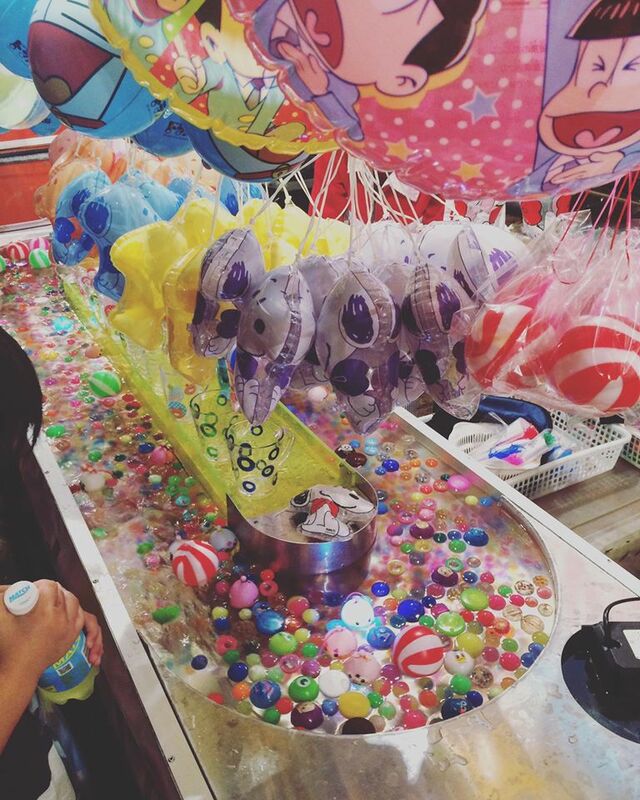 You can walk around with a can of Asahi in hand while you win some hoop throwing games or balloon darts. Up inside the Hakozaki shrine, the line to make a prayer (where you throw money into the box) was another 300 meters long. There were also a row of Omamori stands (Omamori = lucky charm) and Omikuji lucky draws (Omikuji = fortune paper). These Omikujis were a bit expensive, typically they are 100 yen but these were 300 yen. However you can win things like tote bags, t-shirts, up to a round trip flight to Tokyo! I wasn’t too lucky, but I won a lucky charm with a coin inside for money luck. I headed back to my hotel, and found a cheap curry place 2 doors down. It was only 900 yen for a huge plate of curry! You can also get takeaway from there. 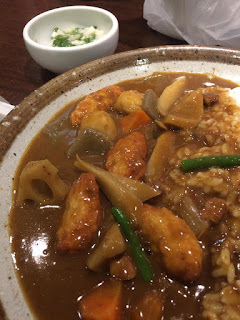 But curry is something I always have to have at least once when I travel in Japan, it is so delicious!! I went to bed pretty early afterwards since I had to wake up at around 6:30am to catch the train to go to Nagasaki. The adventure continues… ! Hi. Looks great! Looking at you pictures i just amazed your work.